In legendary times, in his compassion, Guru Rinpoche tamed a malicious female ogre. This happened in the valley of Shang Zabbulung in what is known today as the Great Practice Cave of Taming the Ogre. Thus the name of the nearby monastery Illustrious Taming of the Ogre (Sindul Palchen srin ‘dul dpal chen). Outwardly, Sindul Palchen is regarded as a Copper-Colored Mountain, a power site of Guru Rinpoche’s body, speech and mind. Inwardly, as a gathering place of the Eight Logos Deities (bka brgyad) adorned with many self-arisen images and objects that serve as a basis for liberation on sight. Secretly, it is a special dakini gathering place for accomplishing the Great Secret (Great Perfection). 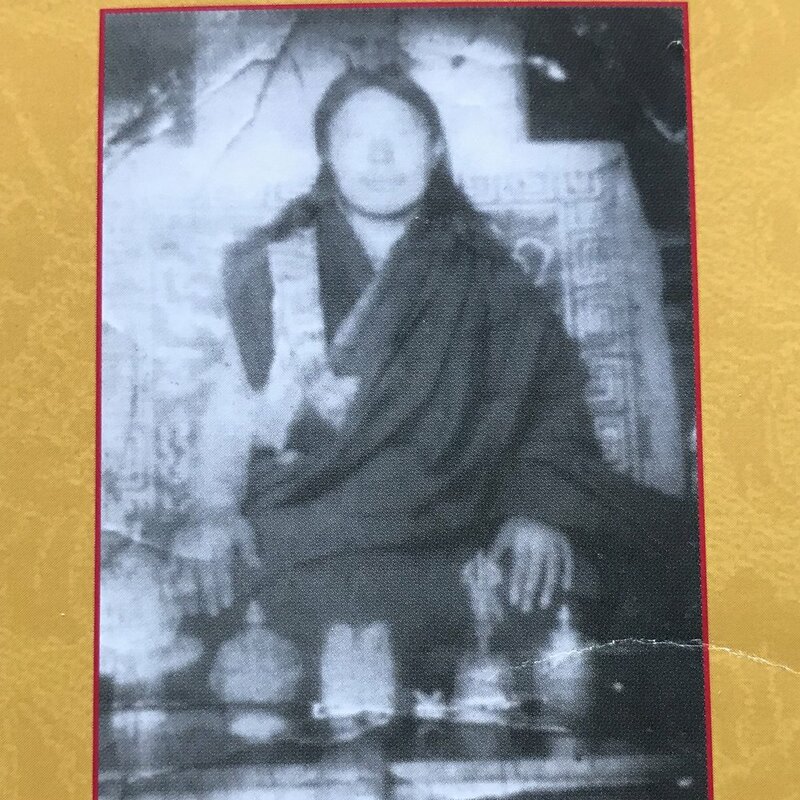 One of the major figures in the recent history of Sindul Palchen is the 20th century treasure revealer, Chönyi Lingpa. He was a rebirth of one of Guru Rinpoche’s Twenty-Five Disciples and lived at Sindul Palchen. Today, his mind emanation is the current abbot, Drupwang Pema Lhundrup Gyatso, (aka Zabtrul Rinpoche) who has gradually restored the sacred site since the Cultural Revolution. Drupwang Pema Lhundrup Gyatso Rinpoche was born in Amdo in Eastern Tibet. He was told in a dream to go to Central Tibet in order to accomplish his life's activity. After thirteen years of retreat at Chimphu, he became widely recognized as a great master or siddha. Again, following visionary instructions, he traveled to Shang Zabbulung, where he eventually became the head of all the Nyingma monasteries in the Zabbulung Valley and abbot of Sindul Palchen. Lama Dechen Yeshe Wangmo first traveled to the Zabbulung valley in 2009, 2010 and 2014. In 2014, through the intercession of Tulku Orgyen Zangpo Rinpoche of Tashi Gomang, she met Zabtrul Rinpoche at Sindul Palchen. And, she met him again in Lhasa in 2015. At these encounters, many wonderful things happened and important connections were forged. To bring the blessings of Sindul Palchen with Western disciples, Rinpoche asked Lama to translate a Sindul Palchen pilgrimage guide and to sponsor a life-size Guru Rinpoche statue for his new temple . The request for the statue was USD$14,000. Fundraising annually through Jnanasukha Foundation and sending offerings to Zabtrul Rinpoche as funds would allow , the project completed this year. In May, a few members of Lama’s pilgrimage group to Tsogyal Latso traveled to Sindul Palchen, although Lama herself was not able to go. Unfortunately, Zabtrul Rinpoche was hospitalized at the time. His monks were delighted to accept the final offering for the statue and offered a celebratory lunch in town. Many thanks and much gratitude to all our donors. Your generosity is much appreciated at Sindul Palchen. Let’s dedicate the merit and pray that all the activities of Drupwang Pema Lhundrup Gyatso come to fruition! ”Pilgrimage Guide to Sindul Palchen”, no publication date.